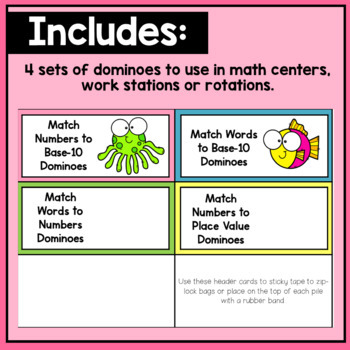 This packet comes with 4 Place Value Tens and Ones Dominoes games with an under the sea theme. 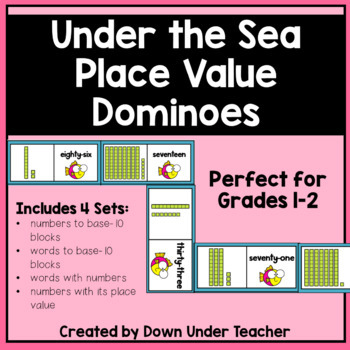 The aim of Under the Sea: Place Value Dominoes is to consolidate understandings of place value, particularly tens and ones. 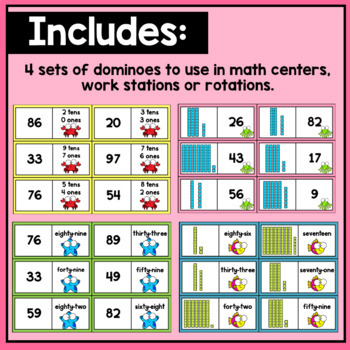 It is suitable for individual, pair and small group work. The game has 4 different sets of domino cards. Each set has a different colored border and picture to easily allow misplaced pieces to be returned. What's the Time Mr Alligator Time Dominoes - reinforce time to the hour, half-past, quarter past and till and to five minutes. Short and Long vowel dominoes - great for reinforcing short and long vowels, digraphs and blends. Language Arts Dominoes - for antonyms, synonyms, homophones, contractions and compound words.